The Amarillo Sox Sock is dead. Long live the Amarillo Sox Sock. 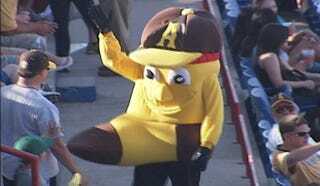 The independent league team only started play this year, and one of the big secrets surrounding the team was to be their mascot. Finally, after much buildup, they got that. The team's GM puts the blame on the costume maker, saying the suit looked like a normal lovable flaccid sock in the photos he had seen. "It was not the way I wanted it," Lee said. "I'm very disappointed in the lady who did it, and I've told her so. She is going to fix it to the changes we want. I want to say on the record, if we offended anybody, I apologize." Immediately after its debut Friday night, the Sock was designated for assignment. He's going back to the drawing board, with the team preparing to re-introduce its new mascot this coming weekend. Yes, the same designer is putting it together. "It's in her hands today," Lee said without a trace of irony.